Securing the airway is only the beginning. At some point, the airway device will need to be removed or changed. This section of the course covers how we assess patients for extubation and device exchange, and how we perform these procedures safely. In the 2011 National Audit Project 4 (NAP 4), about one third of anaesthesia incidents occurred around extubation and recovery.1 The majority of these were due to airway obstruction, with a variety of causes including laryngospasm, occlusion of an airway device by patient biting, blood in the airway or airway swelling. The diagnosis of obstruction was often delayed, resulting in five cases of severe hypoxia and two deaths. The airway can be injured during surgery, tracheal intubation or by repetitive shearing forces caused by the tube, especially in agitated patients in the ICU. These can all cause airway swelling, which can be exacerbated by head-down positioning, fluid overload and any surgery or radiotherapy which alters lymphatic drainage. Nasogastric tubes, endoscopes and trans-oesophageal echocardiography probes can also cause damage which may not become evident until extubation is attempted. 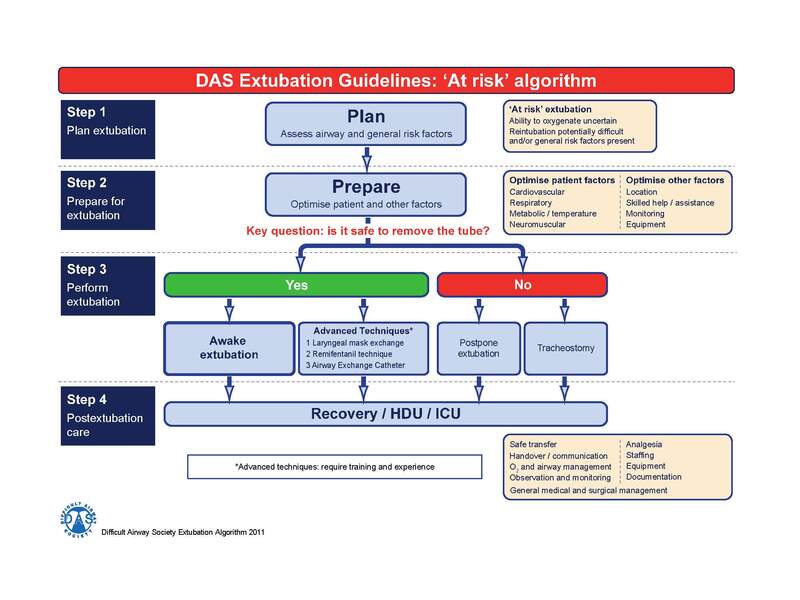 The year after NAP4, the Difficult Airway Society (DAS) published guidelines for extubation.2 They are based mainly on expert opinion, as there is very little trial evidence in this field, and of note, pertain to adult peri-operative care and not to critical care patients. The basic approach involves planning and preparation, followed by risk assessment. 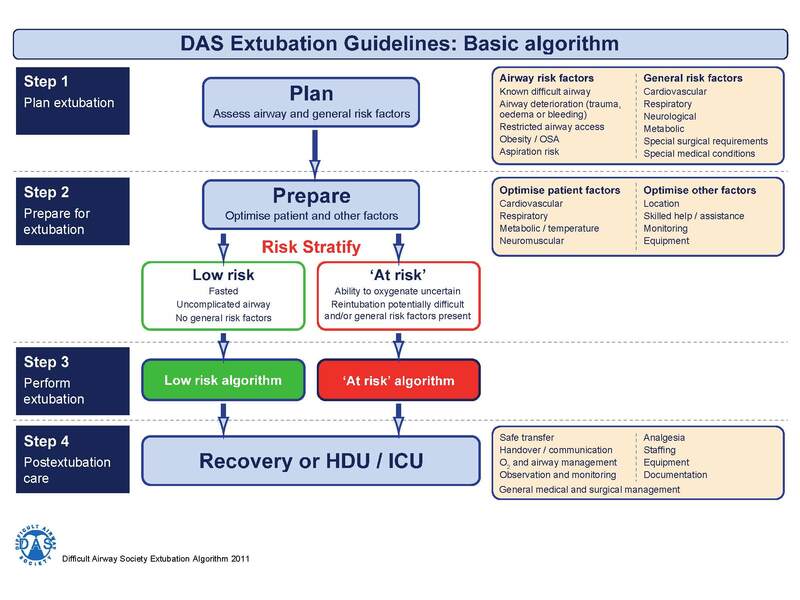 There are then ‘low-risk’ and ‘at risk’ algorithms which should prompt the formation of an extubation strategy. Ideally this should all occur prior to intubation. The strategy should include a plan for the timing and technique of extubation, and the disposition and ongoing care of the patient. These guidelines are very much designed for anaesthetic practice, so the guidelines are not entirely applicable to the patients we encounter in the ED and ICU. However, the same basic principles of planning, preparation and post-extubation care still apply. 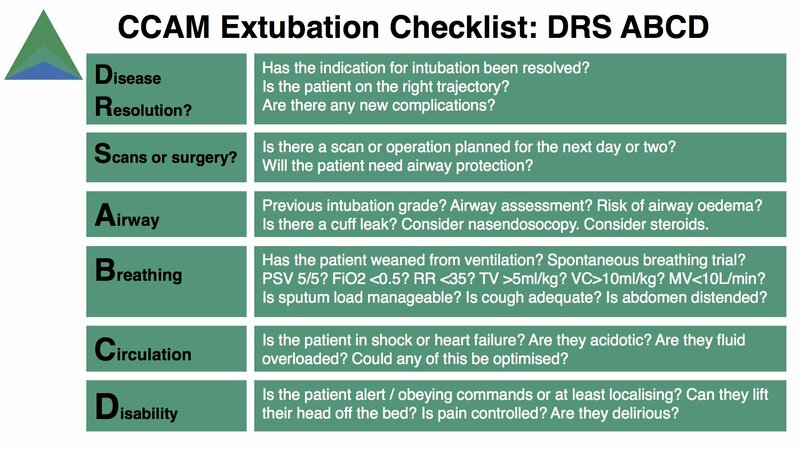 When planning to extubate an intensive care patient, there are many questions that need to be answered – see the CCAM Extubation Checklist below.3 Various test can be especially useful here including blood gas analysis, chest imaging, the bedside assessment of respiratory parameters and nasendosopy. Extubation is a team decision and a team activity. It is important that the nursing and allied health staff are on board with the plan. It may be beneficial, for example, to arrange for an intensive physiotherapy regime after extubation of a patient who has a lot of secretions or a borderline cough. Preparation for extubation should include gathering the right personnel and equipment in case of failure. Equipment should include resuscitation and difficult airway trolleys, wire cutters if the jaw has been wired, and clip removers if there is a risk of haematoma formation around the airway, for example, after thyroid surgery. Humidified oxygen is preferable is the airway is deemed to be at risk. If muscle relaxants have been administered, neuromuscular monitoring should be used to ensure that they have been completely reversed prior to extubation. In high risk post-operative patients, other strategies may also be used, such as laryngeal mask exchange, trans-tracheal catheters and airway exchange catheters (see below). It is important to remember that extubation can always be delayed. Admitting the patient to the ICU for further assessment is prudent if there is any doubt about the airway. The patient can also undergo elective tracheostomy if problems with the airway are thought to be insurmountable in the short term. After extubation, patients must be cared for in the operating theatre, recovery area, ED resuscitation bay, high-dependency unit or intensive care unit. Patient monitoring should include ECG, blood pressure, oxygen saturations and continuous end-tidal CO2. Staff trained in airway management and monitoring of the patient post-extubation should care for these patients. Clinicians with advanced airway skills must be immediately available. Good communication and handover are essential. Patients need to be monitored for signs of extubation failure, by staff trained to elicit these signs. Predictors of the requirement for re-intubation include hoarse voice, cough, difficulty swallowing, drooling, stridor and orthopnoea. Patients should also be closely watched for bleeding; into the airway, into drains or into an expanding haematoma. Airway exchange catheters (AECs) are long catheters designed for changing one airway device (LMA or tube) for another. They include the Cook™ Airway Exchange Catheter (standard or extra-long version for use with double lumen tubes) and the Cook™ Aintree Intubating Catheter, which has a larger internal diameter to allow placement using a fibre-optic bronchoscope (see Plan B). 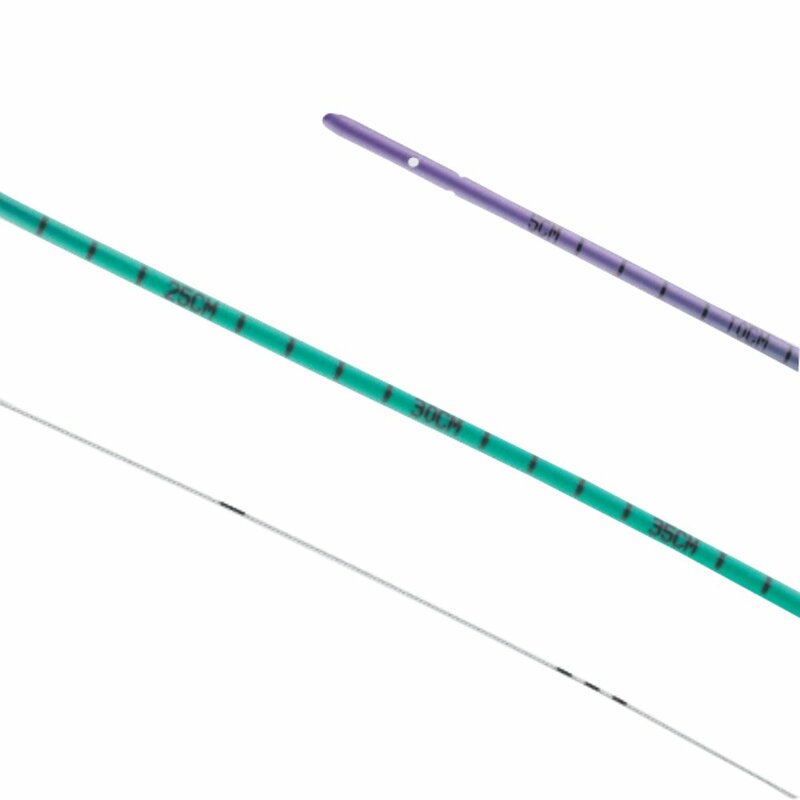 AECs range in size from 8-19 Fr gauge and are between 45cm and 100cm in length. 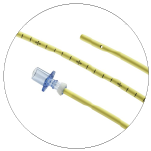 They usually have a hollow lumen for the delivery of oxygen, which is connected to the catheter by either a 15mm or Luer-lock Rapi-Fit™ connector. These deaths were followed in 2011 by a review of the literature.10 The analysis revealed a worryingly high incidence of barotrauma associated with the delivery of oxygen via AECs. Of the 18 cases of barotrauma identified, jet ventilation was used in 16. In one case series included in the review, five out of 45 patients (11%) who received jet ventilation via an AEC developed barotrauma.6 Barotrauma also occurred in two cases where oxygen insufflation was used (different cases to those described above). The authors conclude that jet insufflation via an AEC is associated with significant risk. They also point out that there is no clear evidence that delivering oxygen via the AEC is superior to conventional delivery. Proponents of jet ventilation (and Cook™, the manufacturer) suggest that it can be made safer by starting with low pressures, ensuring that the distal tip of the catheter remains at least 2-3cm from the carina, and checking that the patient can exhale.6,11 The authors of the review point out, however, that two cases of barotrauma occurred with correctly positioned catheters, and that it is often impossible to evaluate the adequacy of exhalation at the bedside. They caution against the delivery of oxygen via the AEC, and suggest that efforts should concentrate on tube delivery if the airway becomes threatened or inadequate. A large case series has retrospectively analysed the practice of staged extubation in 354 high-risk patients.12 On initial examination, the study seems to suggest that the AEC is a useful adjunct. In 303/354 patients (86%), the airway was deemed to be safe and the AEC was removed. In 51 patients (14%), the airway was threatened and re-intubation was attempted. This was successful in 47 patient (92%), with no significant adverse effects, including barotrauma. Of note, the AEC was only used to deliver oxygen in 7 patients, by insufflation at a flow rate of 3-6L/min. Of the 303 patients who had their AEC removed, 36 patients (12%) required re-intubation. This was far more difficult overall than in the AEC patients: many attempts with several different devices were required, and in four patients, a surgical airway was performed. In only 14% of patients was the airway secured at the first attempt, with the first choice device. The effect of the AEC itself on the rate of re-intubation is unclear. It seems reasonable that AECs might actually increase the re-intubation rate, by narrowing the airway lumen, causing trauma and inflammation, and precipitating cough and stridor. The Cook™ Staged Extubation Kit has been designed with these concerns in mind. In this technique, a soft-tipped wire is inserted through the tracheal tube, which is then removed. The wire is narrower and less irritating than an AEC, and can theoretically be left in for a long period. Should the patient require re-intubation, a catheter with a blunt, atraumatic tip is inserted over the guide-wire to stiffen the whole apparatus so that a tracheal tube can be introduced. 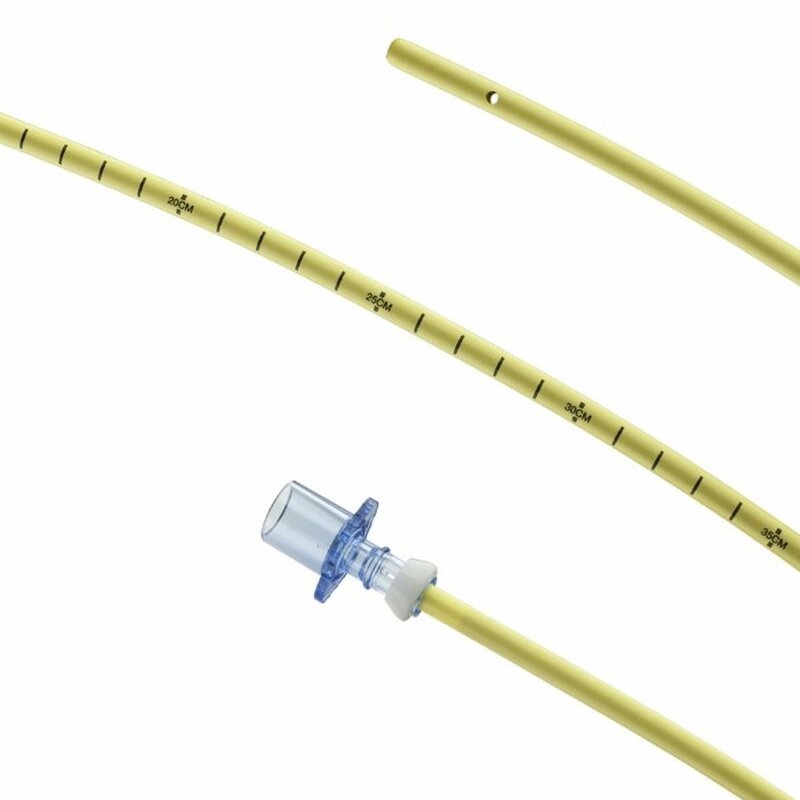 The catheter comes with Rapi-Fit™ connectors to allow oxygen delivery during the re-intubation attempt. 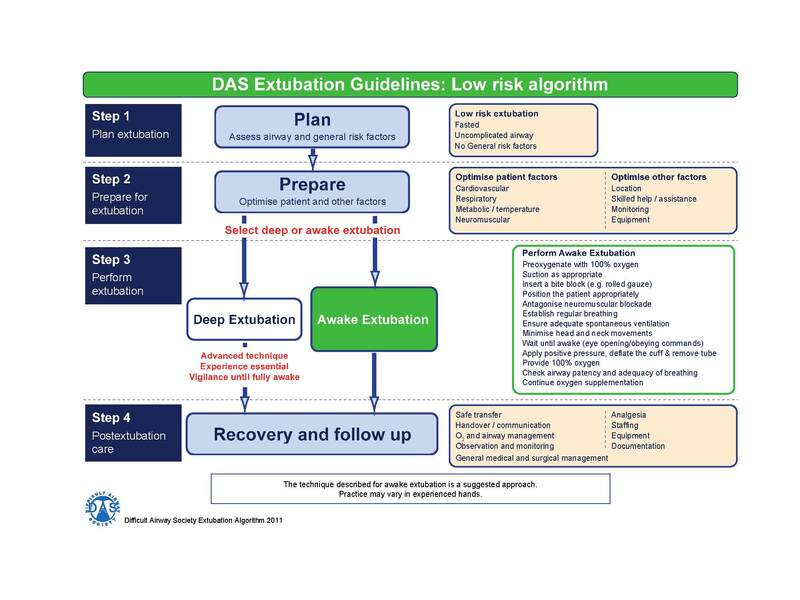 Difficult Airway Society Extubation Guidelines G, Popat M, Mitchell V, et al. Difficult Airway Society Guidelines for the management of tracheal extubation. Anaesthesia. 2012;67(3):318-340. Lermitte J, Garfield MJ. Weaning from Mechanical Ventilation. Continuing Education in Anaesthesia, Critical Care and Pain, 2005; 5: 113-7. Fan T, Wang G, Mao B, et al. Prophylactic administration of parenteral steroids for preventing airway complications after extubation in adults: meta-analysis of randomised placebo controlled trials. Bmj. 2008;337:a1841. Law J, Duggan L. Extubation guidelines: use of airway exchange catheters. Anaesthesia. 2012;67(8):918-919; author reply 921-912.
Cooper RM. The use of an endotracheal ventilation catheter in the management of difficult extubations. 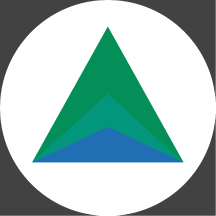 Canadian journal of anaesthesia = Journal canadien d’anesthesie. 1996;43(1):90-93. Determination of Sheriff Linda Margaret Ruxton in fatal accident inquiry into the death of Gordon Ewing, 2010. Available: http://www.scotcourts.gov.uk/opinions/2010FAI15.html. McCallum AL. Airway Exchange Catheters (AEC)/Endotracheal Ventilation Catheter (ETVC), 2010. Available: http://www.cas.ca/English/Page/Files/109_coroner_letter.pdf. Baraka AS. Tension pneumothorax complicating jet ventilation via a cook airway exchange catheter. Anesthesiology. 1999;91(2):557-558. Duggan LV, Law JA, Murphy MF. Brief review: Supplementing oxygen through an airway exchange catheter: efficacy, complications, and recommendations. Canadian journal of anaesthesia = Journal canadien d’anesthesie. 2011;58(6):560-568. 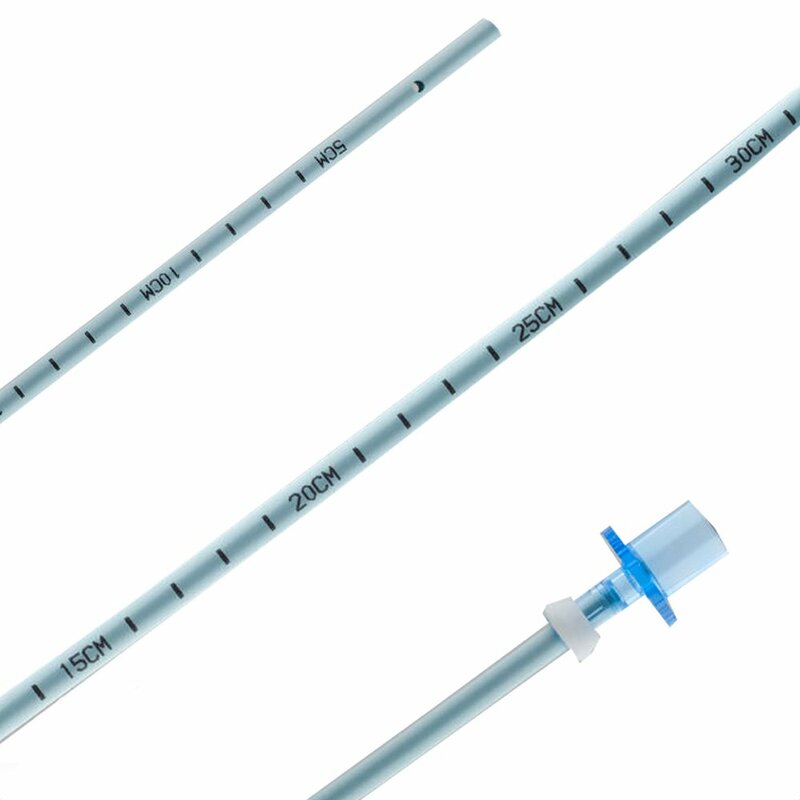 Cook Airway Exchange Catheters with RapiFit Adapters – Instructions for Use. Cook Medical 2011. Available: www.cookmedical.com/data/IFU_PDF/C_T_CAE_REV4.PDF. Mort TC. Continuous airway access for the difficult extubation: the efficacy of the airway exchange catheter. Anesthesia and analgesia. 2007;105(5):1357-1362, table of contents. Biro P, Priebe HJ. Staged extubation strategy: is an airway exchange catheter the answer? Anesthesia and analgesia. 2007;105(5):1182-1185. Ho LI, Harn HJ, Lien TC, Hu PY, Wang JH. Postextubation laryngeal edema in adults. Risk factor evaluation and prevention by hydrocortisone. Intensive care medicine. 1996;22(9):933-936.